I ate the Shaadi ka Ladoo on 22nd December 2018. It's been 16 days since I was married and I must say the journey so far has been exciting. I've experienced a wide range of emotions in a short span. At times my eyes would be filled with tears and moments later I would be laughing my heart out. Getting married is no less than riding a roller coaster. Markets are also the same. They are always on a roller coaster ride moving up and down like a freaky fire breathing dragon. However, this dragon is at rest. Trading activity drops during the fag end of the year. Both foreign and domestic institutional investors take a break from the markets. This time wasn't any different. Markets went nowhere while I was on leave. Nifty closed at a level of 10,805.45 on 14th December (my last working day before going on leave). On Monday, the Nifty opened at nearly the same level of 10,804.85 as I resumed office. The index has coiled in a tight range over the last three weeks. Trading activity dropped but my inbox was overflowing with wishes from Profit Hunter Pro subscribers while I was on leave. All the messages I received were wonderful, but one message stood out. It was from a gentleman who drew a wonderful analogy between markets and marriage. It's Still Within Our Buying Range…Act Fast! A blue-chip auto stock we've recommended multiple times before has now resurfaced with another exciting trading opportunity. The stock is trading within our buying range right now, but that won't remain the case forever. So hurry! 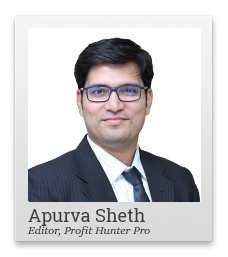 Get full details on Apurva's first trade recommendation of 2019 by simply giving his Profit Hunter Pro service a try. He calls them the thumb rule for married life. However, I feel these thumb rules are good for both markets as well as marriage. You are elder to me in trading knowledge but as far as married life is concerned I'm elder to you so I think I can advise you. As you are a market expert I am comparing married life with market. Generally, many people say markets will erase all your money, it is gambling etc., but you know market will make us rich if we handle it rightly, isn't it? Likewise, many people say married life is boring, it takes away our happiness and freedom and all. But really it is very happy and wife is a greatest support system for our successful life, if you handle her rightly. Otherwise life will be like a southbound journey of market and chance for bounce back is very less. Some similarities of wife and market which you should know before dealing with it. Or Thumb rule of family life. 1. Never go against the trend in market, likewise never go against wife's decision. 2. There will be some opportunities for doing trade even in a falling market if we dig it deeper, likewise there will be some object (gifts) to calm down your angry wife, find them to be happy. 3. Timing the market is very important, try to be home in time without delay. 4. Volatility in market is unavoidable likewise mood swings of wives are also unavoidable. Learn to deal with it. 5. You will not forget important dates for dividend, bonus issues likewise don't forget her birthday, engagement and marriage dates. 6. Buying a wonderful company at a fair price is better than buying a fair company at a wonderful price. Similarly, love and care at right time is more important than costly gifts. Learning is a never-ending process it is also applicable for married life. You can learn new things daily. But love and affection is ultimate, so don't let it down. Be happy and enjoy new era of your life. Congratulations to both of you. Now that's a heartwarming and insightful message which throws light on both markets and marriage. It's always great to read your thoughts and views about our service and how they help you achieve your goals. But it's even better to read such wonderful messages when you are starting a new phase of life. So, over the last four weeks the benchmark Nifty has traded in a range between 10,500 and 11,000. Now it seems like the index will continue to trade choppily until it breaks out on either side of this tight range. It is normally difficult to find trading opportunities in the benchmark index when it trades choppily like this. However, if you are trading stocks then you should be happy to read this. I have found our first trading opportunity for 2019. Profit Hunter Pro subscribers may have already traded the stock once last year. The last time I recommended this stock was in November 2018. We closed the recommendation in 7 days with gains of 5.83%. The stock has slipped almost 20% since we closed the recommendation in November last year. Last time around the company reported results which were below market expectations. Don't Buy Any Stock Before You Read All About These "4 Junior Blue Chips"
In fact, here's the first step we recommend that you take this year…BEFORE you buy any stock! Richa – Editor of our small cap stock recommendation service – Hiledden Treasure – has identified 4 small caps which have SOLID business models…immense growth potential…and are available at deep discounts from their real worth. She calls these stocks – The Junior Blue Chips. In other words, small caps which have the potential to become the Blue Chips of tomorrow. So, before you buy even a single new stock, make sure that you go through full details on this exceptional opportunity. This resulted in a gap down opening. The stock recovered soon from this early blow and traded in the green. We identified a trading opportunity after this and ended with decent gains in 7 days. This time around the stock is down on news of poor set of monthly auto sales numbers. The stock is currently trading near a crucial psychological support level. This level acted as support in October 2018 and seems like it could act as support for the stock this time around as well. Trading volumes in the first three days of the week were on the higher side but the quantum of the fall wasn't significant. This suggests weaker hands were exiting from the stock. The daily RSI is displaying bullish divergence after hitting a 10-year low in October 2018. This suggests limited momentum on the downside. I am expecting an upside of 11.45% in the stock in short term. The stock ended up by a percent yesterday after I recommended it which means its still trading within our buying range. But you never know when it could start flying higher. So, if you want to find out everything about the stock then you can do so here. PS: Apurva Sheth is attacking 2019 trades with renewed vigour - his trades have given upwards of 10% sometimes just within days. This new year - try something new with his fundamental trading service. Get it here - and try his first stock of the year. Equitymaster requests your view! Post a comment on "My First Stock Trading Recommendation For 2019". Click here! 3 Responses to "My First Stock Trading Recommendation For 2019"
Congratulations, May the years ahead be filled with lasting joy. Sir could you suggest techofunda stocks that we could trade in options as well.This would give more leverage to your subscribers. 9433722046 Congratulations ! Wish you a happy and prosperous married life. May Heaven's choicest blessings be showered on you two. Hi Apurva, best wishes to you and your wife in this new (ad)venture. May there always be upper circuits in the happiness.